Women's Original Waterproof Cotton Hunting Coat is rated 4.6 out of 5 by 23. Ce manteau de chasse polyvalent en coton allie une protection tout au long de l'année et un design élégant qui convient à tous les styles de vie. Hautement imperméable grâce à l'application d'un fini hydrofuge durable, ce manteau pour femme offre une protection accrue. Confectionné en coton et doublé de maille, il assure également une bonne respirabilité quand il fait plus chaud. Les poches de chasse à double entrée permettent un bon rangement, et le capuchon et les poignets réglables offrent une étanchéité à toute infiltration indésirable. Rated 5 out of 5 by Ettie from Can't go wrong with this coat! Great quality and beautiful colour. Size S is perfect for my 5'2", 120lbs frame. Sleeves are a bit too long but I fold them up maybe an inch and it's no big deal. Plenty of room for a sweater underneath without looking frumpy or boxy. You can tighten up the waist string for a more fitted look. Great purchase, no regrets whatsoever. Rated 4 out of 5 by Pye3.14 from Love the coat, made large! I absolutely love the coat, it's cute and does the job. However, I find it made very large. I purchased a size small and I wear a size 6 in everything. It seems to fit in in the shoulders, but the belly is massive, I feel like I could fit 2 of me in there. Even had I cinch the waist all the way, I feel like I could of cinched it more. Wish I went with a size down, but then i would be worried about it not fitting in the shoulders. Rated 5 out of 5 by Lori1345 from Great quality! I was very happy with the quality of the fabric! Has nice weight to it. Fits very nicely. I'm 5'7", 140lbs and medium fit well. Tried small too, which looked good, but no room in shoulders to move with a sweater on. Used it only once to walk the dog on 10 degree C day... was perfect. Have to wait till spring to give it a real test because it's mostly minus 10 degrees or less here! Rated 5 out of 5 by MRSS from Love it, runs large. I bought a medium as I’m usually a size 6 but I just had a baby so I’m about an 8 now and my bazzungas are pretty huge. Still had to exchange it for a small, which is nice a roomy on me. It’s nice and lightweight but warm and the perfect length. Rated 4 out of 5 by Ian O from Nice coat but strange sizing. 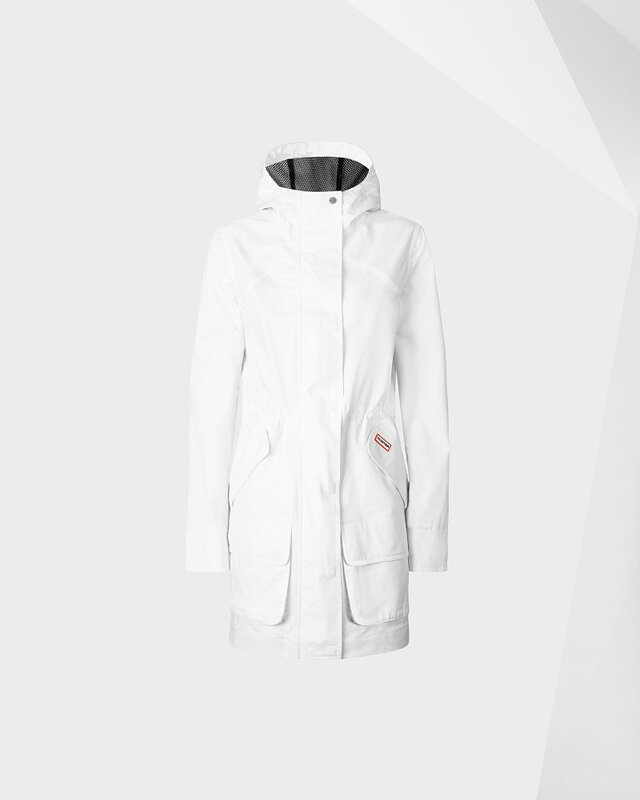 I purchased the Hunter coat in white as a gift for my wife. It arrived promptly and when I opened the package I immediately liked the coat, its style, material and quality. However, when my wife tried it on I knew right away that I would have to return it. I had ordered a medium size, knowing that she would want to wear a sweater or fleece jacket under it and that her previous raincoat was a medium. She stands 5'4" and weighs 118 pounds. The coat was generally a bit oversized, but what sealed its fate was that the sleeves were so long that her hands disappeared completely from view, even when she pointed her fingers straight down. The sleeves have cuffs, so rolling them up is not an option. In hindsight I now see from the photographs on the website that the sleeves are abnormally long. It's a shame, because in every other way my wife loved the coat - she just couldn't wear it. Fortunately, Hunter provided a return mailing label and credited me with the full purchase price, so the customer service was excellent. Rated 4 out of 5 by jaya from beautiful coat coat is beautifully detailed. haven't tested it out in the rain yet (it's winter), but i'm sure it'll be fine. shoulders are really snug which is weird because everything else fits perfectly fine. Rated 5 out of 5 by SLuA from Beautiful and flattering This jacket is gorgeous and flattering and very good quality. I loved it so much I bought 3!